Miss Independence Day Queen Meghan McCracken and Mills pose while Quentin Glass, 8, takes a photo on McCracken's phone. 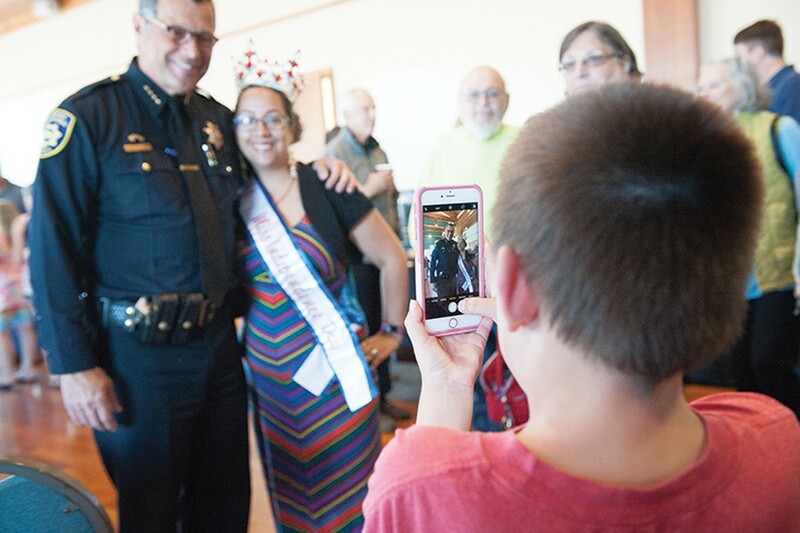 Andrew Mills had just finished lunch and was strolling through Old Town on a Thursday afternoon, just about 24 hours before his almost four-year tenure as Eureka's chief of police was to come to an end. Every few yards someone stopped him. There was the old department volunteer, the rabble-rousing community organizer, the former Marine, the woman in her early 20s and the retired district attorney. All were effusive in their praise and well wishes. 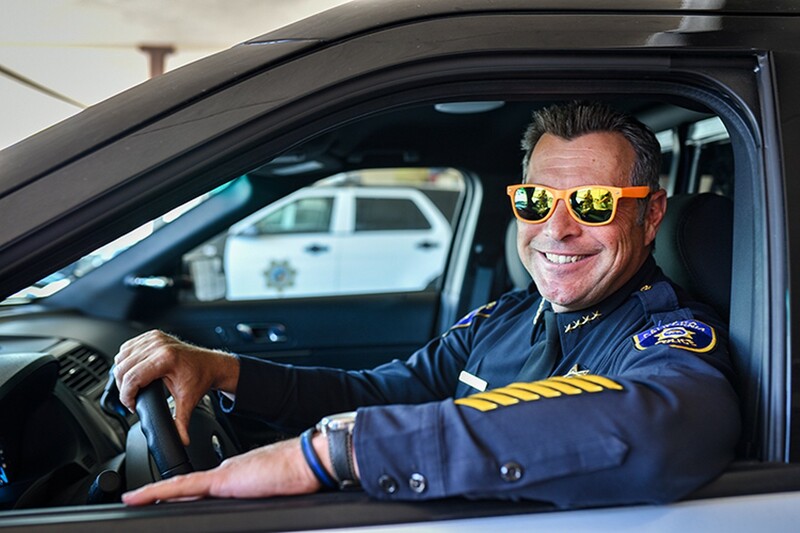 "The department was somewhat fragmented and, you know, they were kind of floundering there for a while," recalled former Councilmember Melinda Ciarabellini, who sat on the council when former City Manager Bill Panos, after a somewhat disastrous process, plucked Mills from the ranks of the San Diego Police Department to become Eureka's next chief. With the turmoil the department had been through, Ciarabellini said she was unsure what to think of the hire at the time. She'd liked some of the applicants, including a couple of locals, but "didn't know the guy from San Diego," and questioned the wisdom of going outside of the local area to "find a metro police chief." But a short time later, Ciarabellini and her fellow council members met Mills at a League of California Cities conference. Mills looked her straight in the eye, offered a firm handshake and introduced his wife, Cathy, right away, Ciarabellini recalled. "It was one of those feelings you get right off the bat — this was the guy. It was right," she said. "I thought, 'This might go well.' And it did." 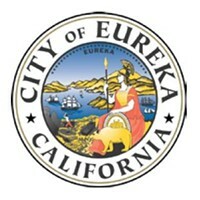 Ciarabellini paused when asked just what it was that made Mills' tenure in Eureka so widely regarded as a success. "I would put it this way, he was the people's chief," she said. "He was approachable, he was friendly, he was respectful. But he was also a cop's cop because when you have to be a cop and set things straight, then you have to do what you have to do. He even did that well, with great respect." 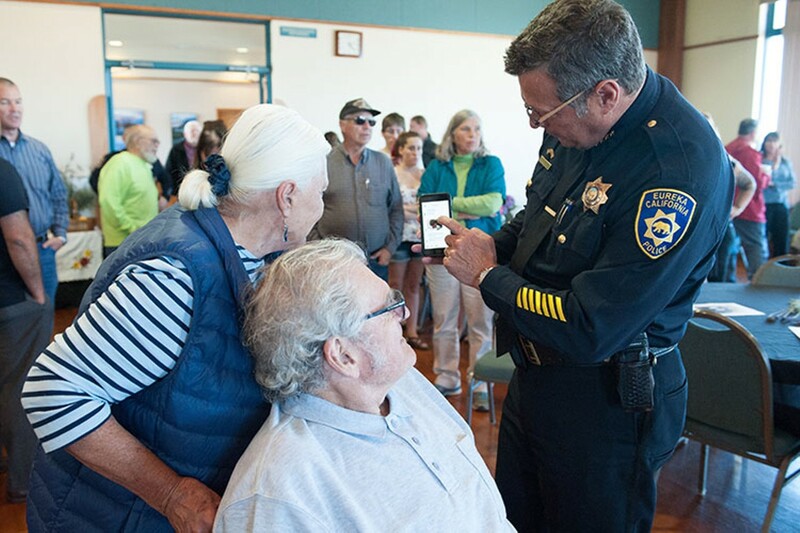 A local law enforcement official recalled recently a conversation with Mills shortly after he'd arrived from San Diego, where he'd headed gang units, community policing teams and even entire districts, but had never been the face of the organization. "I told him, 'Andy, you can't kiss every baby, you can't go to every community event and every neighborhood meeting. 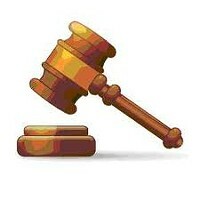 You'll burn out,'" he said, chuckling and adding that Mills had largely disregarded that advice. And for many, that will be the measure of Mills' legacy in Eureka — his constant efforts to bring EPD and the community it serves together. 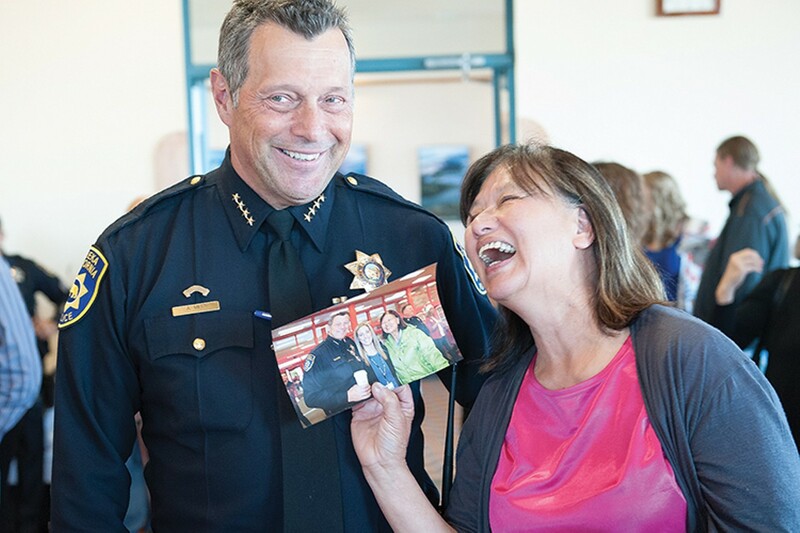 To that end, Mills did a lot — starting up "Coffee with the Captains" and "Shop with a Cop" events aimed at making connections. But Mills also brought more substantive changes to EPD, many of which managed to toe the line between "people's chief" and "cop's cop." He outfitted the department with body cameras and instituted a policy that prohibited officers from viewing footage of critical incidents before giving their statements to investigators. He ended the city's longstanding practice of intentionally holding some officer positions vacant in a fiscal sleight of hand, insisting that — budget-be-damned — he was going to fully staff EPD. He restructured the department, promoting a pair of captains after seeing three long-standing EPD leaders retire. He empaneled a "chief's advisory committee" to weigh in on policy, critical incidents and employee discipline, but stopped short of giving it any real authority. After officer-involved shootings — of which he saw several — he held press conferences with detailed reports of what happened but never publicly criticized the officers involved. 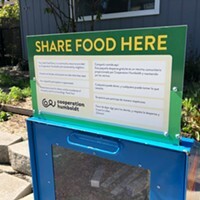 And in perhaps his most visible act as chief, Mills spent months resisting Eureka's push to clear the PalCo Marsh, insisting he couldn't kick homeless people out of their encampments without pointing them toward a legal place to stay. But when the department's marching orders were given, his officers executed a detailed strategic plan that resulted in a smooth eviction. Mills also had plenty of difficult days: Within a few months of his first day Eureka he saw one of the most shocking crimes in recent memory with the New Year's Day murder of a beloved local priest; nine months later, an EPD officer fatally shot Thomas McClain in his front yard; and there was the afternoon in which officers fired 43 rounds while chasing an armed suspect through downtown Eureka at 5 p.m., to name just a few. City Manager Greg Sparks said that, despite some bumps, he found a lot to like about Mills' time in Eureka but what stands out most is just how well liked the chief was. Police chief is a tricky position, Sparks said, adding that a decision that's likely to draw praise from one quarter is almost sure to bring scorn from another, whether it be the officers' union, civil rights groups, business owners or other city department heads. Mills, however, seemed to navigate all the land mines deftly. "I've seen a lot of police departments over the years where it's easy for them as an organization to see themselves separately from the rest of the city," Sparks said. "I think Andy just brought that kind of value that we're all part of this city, all working together and all trying to accomplish the same things as far as making this community better. He's probably the most well-liked, respected chief I've seen in the decades I've been doing this."